Focus on Anne Frank.  Children are innocent victims of war. They can lose parents or are injured or killed in crossfire. Some are captured, imprisoned. 2  Children are innocent victims of war. They can lose parents or are injured or killed in crossfire. Some are captured, imprisoned or die of starvation. Many become orphans.  One child dies every three minutes in armed conflict in our world today. Is that hard to believe?  Over the last ten years, about 1.6 million children have been killed in war battles in their countries. 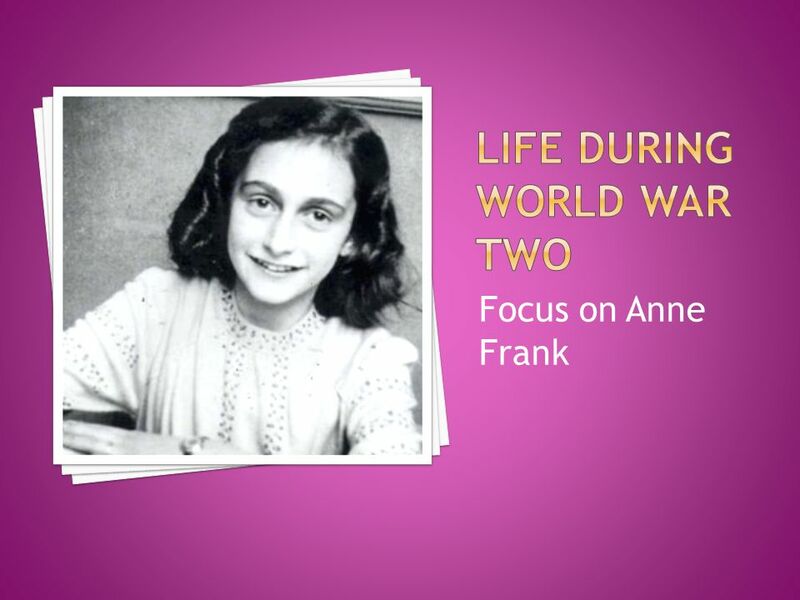  Anne Frank lived through a war and we are going to find out more about her today. 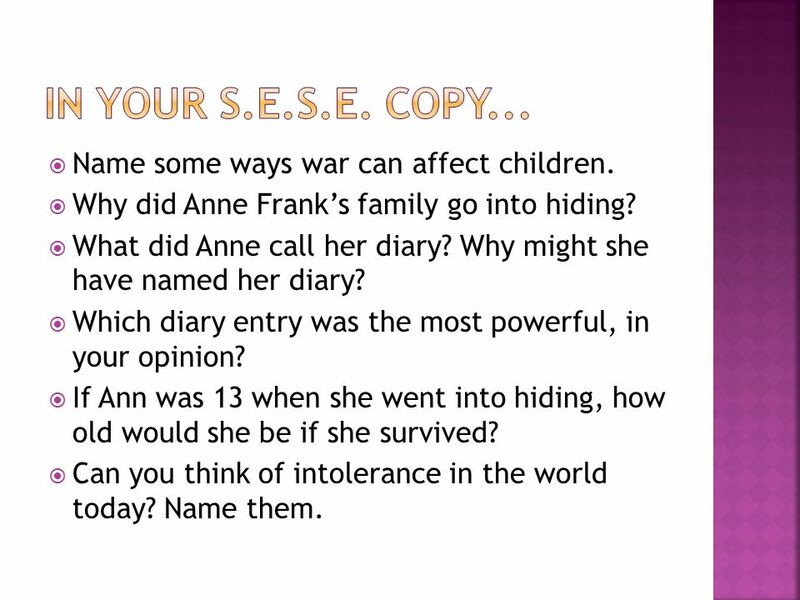 3  What do you know about Anne Frank already?  Which war did Anne live through?  Do you know what a Concentration Camp is?  Do you know where Anne lived?  Do you know how old Anne was? 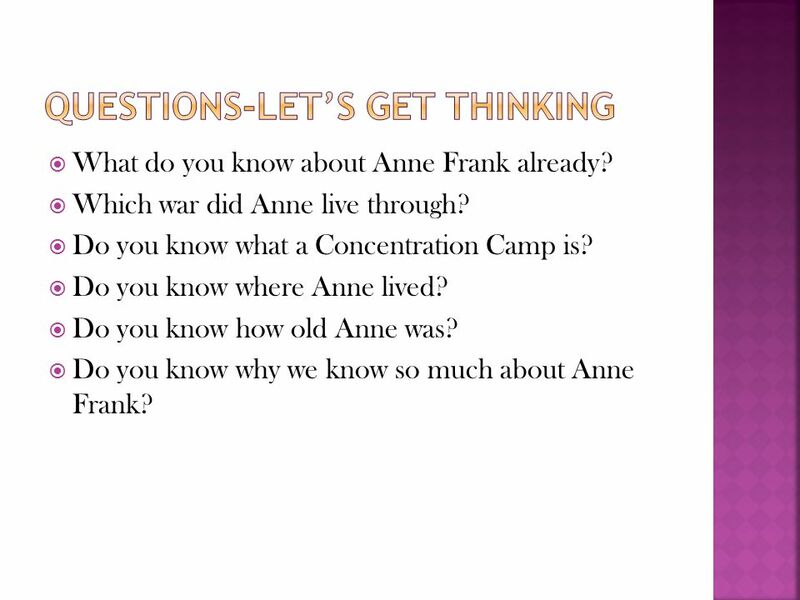  Do you know why we know so much about Anne Frank? 4  Anne Frank was a Jewish girl living in Holland, during World War II. She lived in the city of Amsterdam and had to go into hiding from the Germans for fear of being sent to a Concentration camp.  She went into hiding in the secret attic of a building in Central Amsterdam on the 6 th of July 1942.  She took ‘Kitty’ with her, a red and white tartan diary she had received on her 13 th birthday. 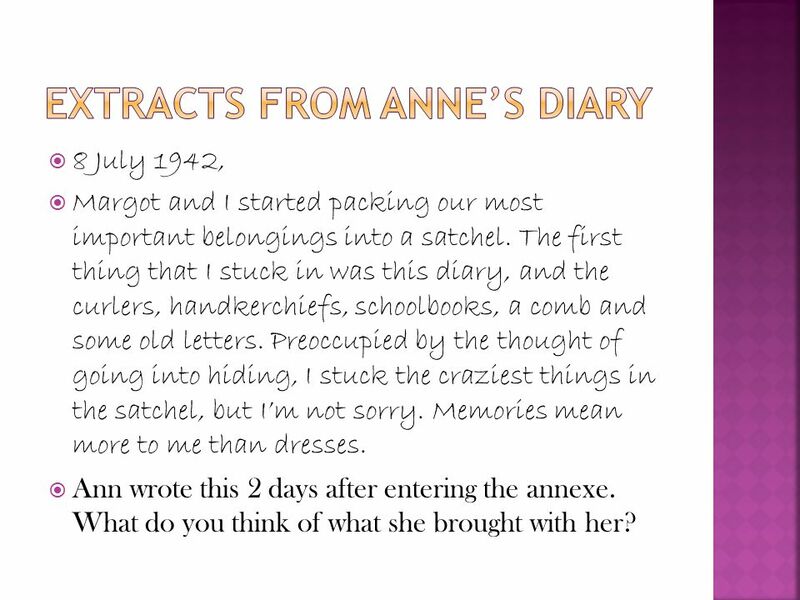  During her two years in hiding, Anne wrote in her diary every day.  Unfortunately Anne and her family were eventually found by the Germans and she later died in a concentration camp. 5  These were prisons that were set up by the Germans in order to get rid of people. 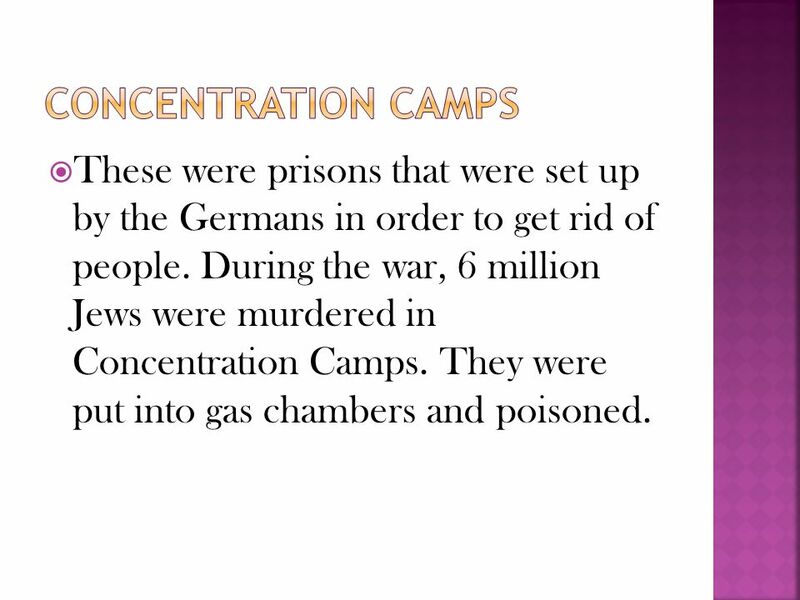 During the war, 6 million Jews were murdered in Concentration Camps. They were put into gas chambers and poisoned. 6  Anne’s diary is a wonderful form of primary evidence from the past.  When we study something that is a direct link to the past, we call it a primary source.  An example of this is a video of someone, a photograph, a sound recording of a speech or something as simple as a letter that someone wrote. 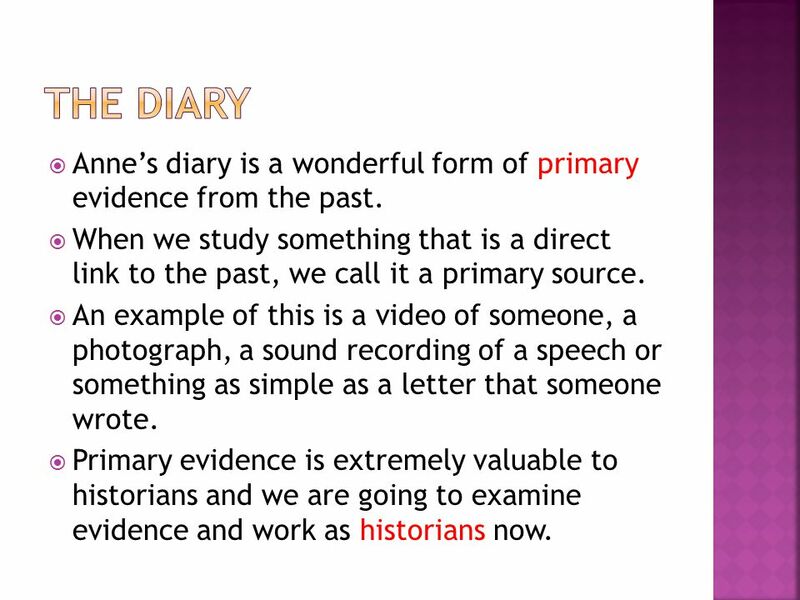  Primary evidence is extremely valuable to historians and we are going to examine evidence and work as historians now. 7  8 July 1942,  Margot and I started packing our most important belongings into a satchel. The first thing that I stuck in was this diary, and the curlers, handkerchiefs, schoolbooks, a comb and some old letters. Preoccupied by the thought of going into hiding, I stuck the craziest things in the satchel, but I’m not sorry. Memories mean more to me than dresses.  Ann wrote this 2 days after entering the annexe. What do you think of what she brought with her? 8  24 December, 1942  Believe me, if you’ve been shut up for a year and a half, it can get too much for you sometimes. But feelings can’t be ignored, no matter how unjust or ungrateful they may seem. I long to ride a bike, dance, whistle, look at the world, feel young and know that I’m free, and yet I can’t let it show.  What would you miss the most if you were forced into hiding in a secret room? 9  11 April 1944  The time will come when we’ll be people again and not just Jews!... We can never be just Dutch or just English, or whatever, we will always be Jews as well. And we’ll have to keep on being Jews, but then, we’ll want to be.  Do you think Anne is happy to be a Jew? Why does she feel they are not ‘people’? 10  15 July 1944  I see the world being slowly transformed into wilderness. I hear the approaching thunder that, one day, will destroy us too, I feel the suffering of millions. And yet when I look up at the sky, I somehow feel that everything will change for the better, that this cruelty too will end, that peace and tranquillity will return once more.  What is the feeling of this extract? Does Anne really hear thunder? How much do you think Anne knows about what is going on? How can you tell? 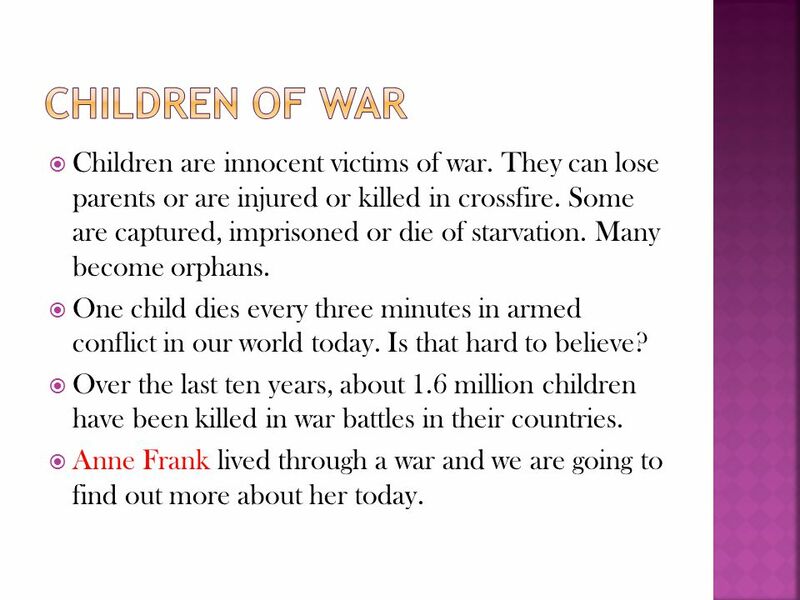 12  Name some ways war can affect children.  Why did Anne Frank’s family go into hiding?  What did Anne call her diary? Why might she have named her diary?  Which diary entry was the most powerful, in your opinion?  If Ann was 13 when she went into hiding, how old would she be if she survived?  Can you think of intolerance in the world today? Name them. 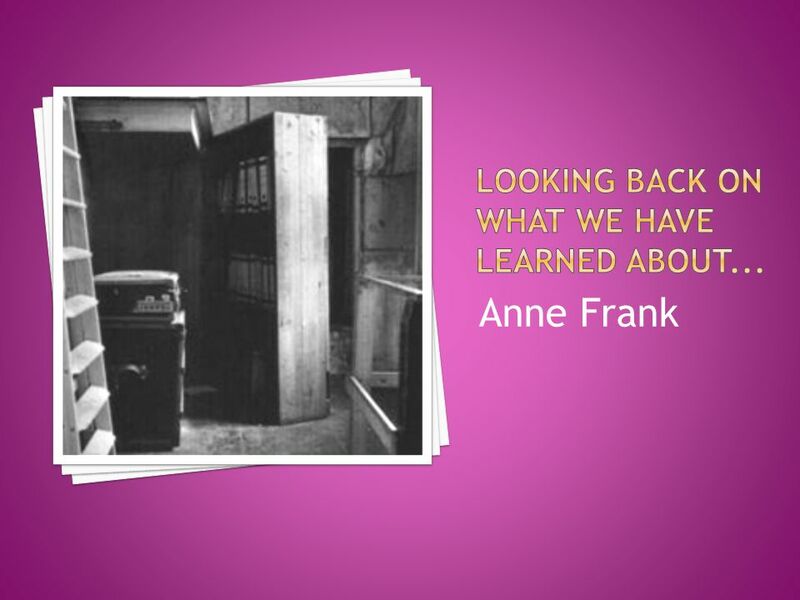 Download ppt "Focus on Anne Frank.  Children are innocent victims of war. They can lose parents or are injured or killed in crossfire. Some are captured, imprisoned." 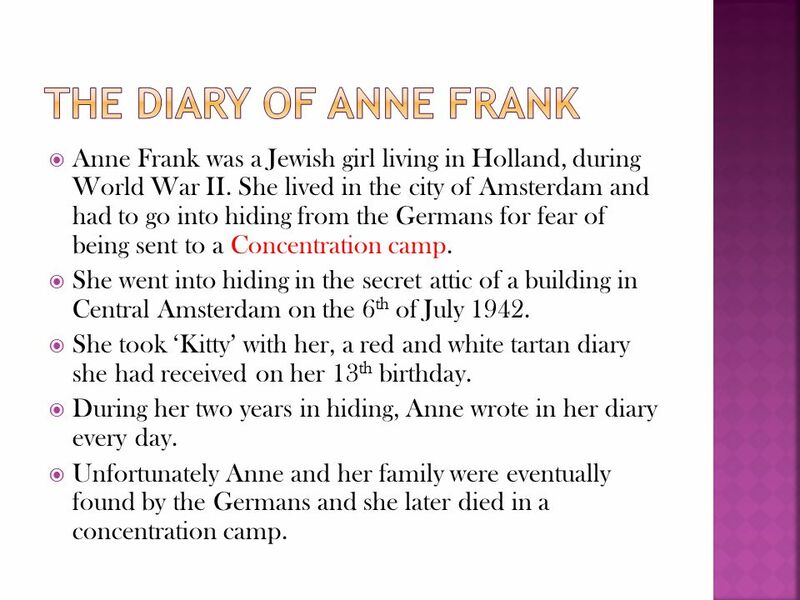 Background:  Anne Frank was born on June 12 th 1929 in Germany & later moved to Amsterdam with her family  She received a diary for her 13 th birthday. The life of Anne Frank By: Allie Clark. Inside the Secret Annex Fieldtrip created by: Mr. Erickson 2006 “We can never be just Dutch, or just English, or whatever, we will always be Jews as well. Who was Anne Frank?. Anne Frank Anne Frank was a Jewish girl living in Amsterdam in Holland. On 12 th June 1942 her parents gave her a small red and. Group 14 The story of Anne Frank’s Dairy. Discourse Analysis Cohesion Coherence Culture Critique Context Discourse activity. The Holocaust A look at the genocide of World War II. Anne Frank by: S. F.. 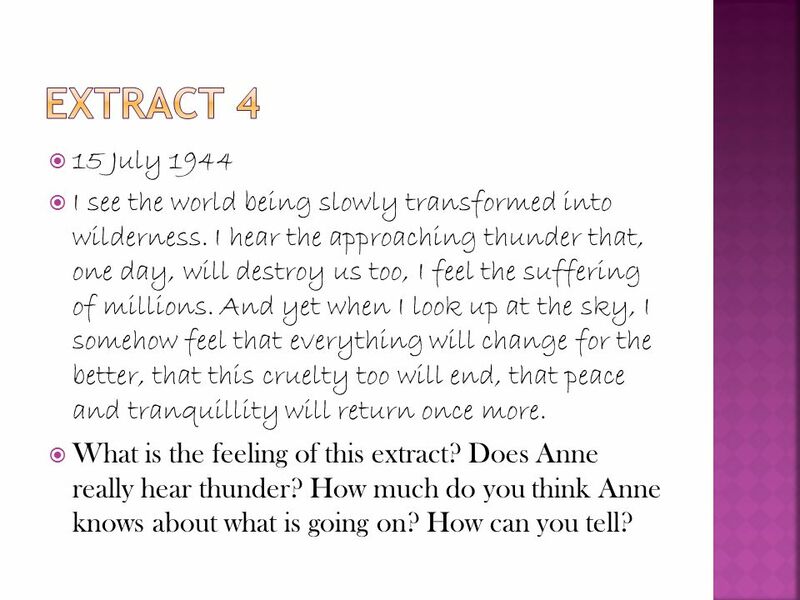 The diary of Anne Frank Anne Frank was a young girl who was just trying to live a normal life during World War II. She and her. Anne Frank was a Jewish girl, born June 12, 1929 in Frankfurt am main and lived through the time that Hitler was ruling Germany. Her family escaped. 8 th Grade English. About Anne Frank  Born in Frankfurt, Germany, on June 12,  She was involved in the events that led to World War II and the. English Creative Writing Session Two 28 March 2009. By Adriana. The holocaust started actually when WWI ended and Germany signed the Versailles Treaty. Adolf Hitler, who believed that the Jewish were responsible. By: Primary Seven Click the mouse to view the rest of the show. The Secret Annex.  Social Studies Standard 2 – World History  Objectives: 1. Students will be able to identify the location of the Annex on a world. Food and shopping There were no supermarkets. You went to different shops for different items. For fruit and vegetables you went to the greengrocer. For.